The Crosstown Showdown means MSU versus the Luggies and its one big party kicking off spring. It&apos;s fun to see two different worlds collide. Want an example of what I mean? My mind immediately goes to a scene in the movie Who Framed Roger Rabbit, when for a minute Bugs Bunny and Mickey Mouse share the screen for a scene. If I remember right theyre both skydiving. Anyway, you never normally see these two together, so when you do you feel like you&apos;re really seeing something special. Well thats what we have coming up in downtown Lansing on April 3 at 7 p.m. - The Annual Crosstown Showdown where the Lansing Lugnuts take on our favorite Big Ten team just down the road, the Spartans of Michigan State University. A baseball match-up of Division One College versus Minor League. Green versus red. 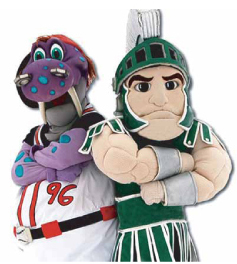 Sparty versus Big Lug. It&apos;s a fun match-up with all kinds of local implications, but along with that its an awesome baseball game. I don&apos;t need to remind you we&apos;ve had a heck of a winter and I know just about everybody is ready for the warm weather that brings baseball with it. Just to get out in the sun, smell the grass, hear the crack of the bat, the roar of the crowd, ahh. A delight to the senses! Come out to Cooley Law School Stadium and catch this awesome match-up of local sports entities and heck yes, have a beer or two, as its also a Labatt Blue Thirsty Thursday! Get there early too (with as many friends as you can as this event is absolutely affordable for families and poor college students) because the first 2,000 fans in attendance will receive a special commemorative gift. The Lansing Lugnuts and the Michigan State Spartans are both looking forward to fantastic winning seasons, but for now, its time for a warm up - a battle for local bragging rights. Well I promise you this, no matter who wins, the winner will be you! Spring is here, get out and enjoy it, Lansing-style! Great tickets still remain, so don&apos;t delay, get your tickets now!